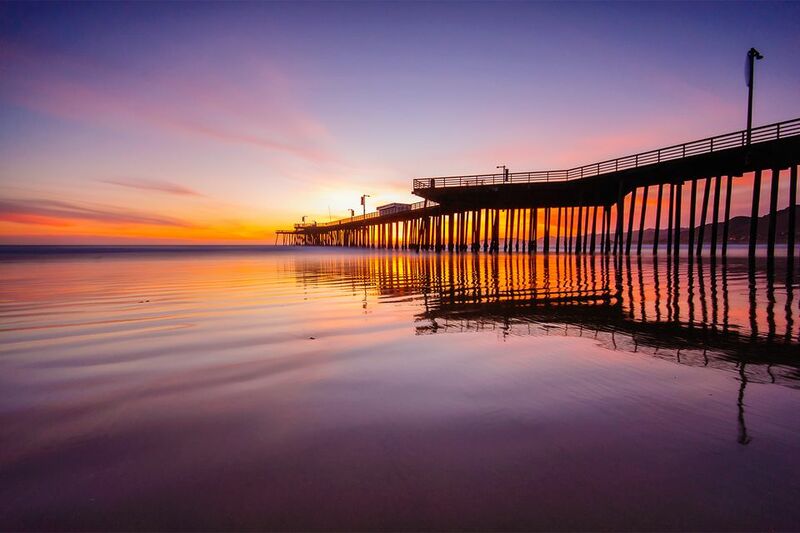 Pismo Beach, located halfway between San Francisco and Los Angeles is the quintessential California beach town. It's a smaller town, with a short main drag leading to a pier jutting out into the sea. It's the kind of place where you can play beach volleyball or fly a kite, then drop into the local clam chowder joint for a bite to eat. Why Should You Vacation in Pismo Beach? If you're planning a Pismo Beach vacation, it's perfect for a family getaway or a wild time playing on the sand. With wide, sandy beaches, Pismo has plenty of places to work on your tan, build a sand castle or dig for Pismo clams. The sand dunes on the west side of town are a fun place to ride an ATV or take a guided tour in a Hummer vehicle with Pacific Adventure Tours or Xtreme Hummer Adventures. Passenger vehicles can also drive onto the beach - and you can camp on it, too. If you get tired of the beach, the San Luis Obispo wine country is nearby. Californians know that summer isn't our best beach season, but in case you're from somewhere else and planning a Pismo Beach vacation, you need to know that the California coast is prone to "June gloom." That happens when the offshore ocean fog layer comes inland and hovers over the shore all day long.​ It can start as early as "May Gray", sometimes lingering into "No Sky July". That makes it easy to guess that April or August may be better times of year to visit. In fact, the best time for a Pismo Beach vacation, weather-wise is Spring or Fall when the skies are clearer and crowds smaller. Riding on the dunes is the most popular activity at Pismo Beach, but there's plenty to do besides that. You can play on the beach, go on a biplane ride, go visit a scenic lighthouse or take a drive along the coast. Monarch butterflies winter at Pismo State Beach from November through February. The Pismo Beach Classic car show brings lots of cool autos to town the third weekend in June. The Pismo Beach Clam Festival happens in October. You'll find plenty of places to eat in your Pismo Beach vacation and some nice places for oceanfront dining. You can use your favorite app or website to find a place to eat that will suit your taste best, but you can't beat Splash Cafe at 197 Pomeroy Ave for yummy clam chowder. According to AAA's Via magazine, Splash Cafe was mentioned among the best places to eat clam chowder on the West Coast. All those happy customers can't be wrong, slurping up more than 40,000 gallons of it per year. Just down the street, Brad's restaurant serves good clams and chips (or fish and chips) and they have a sunny outdoor patio. You'll find plenty of hotel options for your Pismo Beach vacation. Some of them are situated on the bluffs above the ocean, with fantastic views. You can use Tripadvisor to compare prices and check visitor reviews. Many people also spend their Pismo Beach vacation in a recreational vehicle. Some of the area campgrounds include companies who will rent you an RV and deliver it to your campsite even if you don't own one. A few miles north of Pismo Beach, San Luis Obispo is one of California's oldest towns, with an old Spanish mission to explore and a lively downtown shopping area. Avila Beach is just north of Pismo, on the north side of the shallow bay. It's a smaller place, with a charming fishing harbor and a few places to eat. Tours to visit the scenic Point San Luis Lighthouse also leave from Avila.